Aubrey Edwin Hyde was born in Yeovil in the winter of 1899, the son of carpenter and joiner Edwin Hyde (b 1862) and Emma EM née Legg (1863-1930). In the 1901 census Edwin and Emma were listed living at 69 Reckleford (today's Market Street) almost at the corner junction with Court Ash with their children; Frederick (b 1885), Percival (b 1887), Benjamin (b 1888), Francis Henry (b 1890), Leah Minnie (b 1892) and one-year old Aubrey. By the time of the 1911 census Edwin and Emma were living at 66 Reckleford Hill (today's Reckleford) with Francis, Leah, Aubrey and seven-year old Maurice Augustus. Edwin now listed his occupation as a builder, while 11-year old Aubrey was at school. Aubrey's military career is a bit sketchy - he initially enlisted at Yeovil in the Devonshire Regiment (Service No 8/11229) but was then posted to the 2nd/4th (City of London)Battalion, Royal Fusiliers (Service No 95550). Because of his age, it is unlikely that Aubrey enlisted much before the beginning of 1918. The original 2nd/4th Battalion had been disbanded at Rouen in June 1916, after which the 3rd/4th Battalion was renamed 2nd/4th. The 3rd/4th Battalion was a Territorial Army Battalion created in London in September 1914 under command of 2/1st London Brigade, in 2/1st London Division. The Battalion was in France from June 1916 onwards. Also known as the City of London Regiment, the Royal Fusiliers raised no fewer than 47 battalions for service in the Great War. This makes it the fifth largest after the London Regiment, Northumberland Fusiliers, Middlesex Regiment and King's (Liverpool Regiment). The Battalion landed in France in January 1917 with 173rd Brigade, 58th Division. The Battalion fought with that division until September 1918 when it was broken up and personnel transferred to the 2/2nd Battalion. Aubrey's service history is unclear but he was killed in action on 9 August 1918. He was aged just 18. 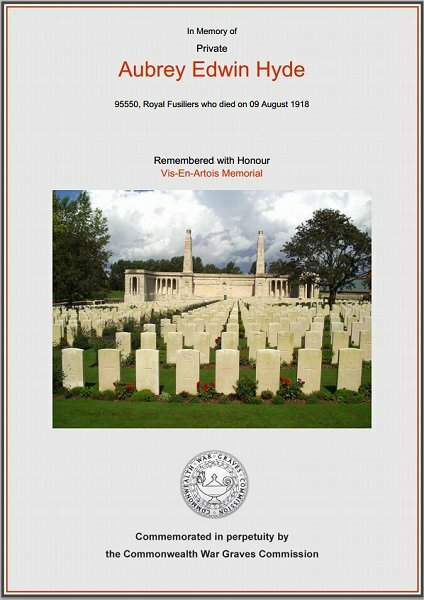 Since he is commemorated on the Vis-en-Artois Memorial, Aubrey must have been killed during the Advance to Victory in Picardy and Artois, between the Somme and Loos. Aubrey is commemorated on Panel 3 of the Vis-en-Artois Memorial. His name was added to the War Memorial in the Borough in 2018. The Commonwealth War Graves Commission certificate in memory of Aubrey Hyde.